I am already experienced when we talk about those mighty German festivals. Keep It True, Headbangers Open Air, Swordbrothers! I’ve been there several times and although the distance from my home is pretty far I am addicted to them, so addicted that I don’t really mind driving all those kilometres. The really cool ‘Eighties’ atmosphere, the international crowd, the opportunity to see my favourite bands that will never visit Belgium again…. Fantastic! The organization of the Keep It True Festival seems to be very busy and during the years also other festivals are organized. 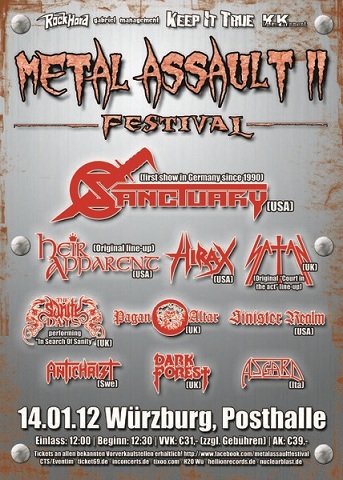 In the past there were two KIT’s a year, since last year the METAL ASSAULT festival saw the light of day. It’s another True Metal festival, a one day Fest during winter. The ‘place to be’ is the Posthälle in Würzburg, a middle great town in the centre of Germany. So, the idea became reality and one of the most respected Lowlanders organized this trip and the result was a full bus of old and new generation Metal fans. We took of in the early morning and a more than six hour during trip took us to the Festival hall. Forty-two Metal heads from which some are good drinkers, are always in for some fun… During the trip we witnessed some old school Slayer on DVD (Heavy Sound festival 1985) and that was entertaining! Coffee for me, beer for the rest, fun for everyone who was already awake! I have been in that venue before and I remember it was a very good place for Metal concerts. As a matter of fact one of the earlier KIT Festivals took place in the “Pösthalle”, in the centre of this town near the train station. Metal and train stations, there has always been a connection! It’s rather strange to see that much Metal heads in such an area after so many years, dressed like they came out of some time machine dated somewhere in the midle of the Eighties. Twenty five years ago this kind of visuals were common but nowadays? Leather jackets, jeans with lots of patches, long hairs, basketball sport shoes… I just love it, a nostalgic feeling is taking part of me but I realize ignorant and probably innocent stand byers are watching them with scary eyes. They’re sceptical, no doubts! 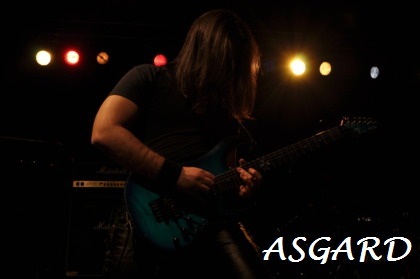 First band of the day was ASGARD from Italy. We just arrived in the hall when they took off! ASGARD released a surprising album last years, one of the kind fans of the old AGENT STEEL will like for sure, especially because of the vocals. That these guys are fans of the old school Speed Metal scène was very obvious and so their singer appears on stage with an old fashioned spandex pants with black and white stripes. Remember them from the early Eighties? Well, it was fun to watch it but it didn’t hold ASGARD to bring a very good show. The venue was still pretty empty but as usual the Germans were singing along like they were watching one or another classic mainstream band! ASGARD proved that they have a future in the True Metal scène but at least I expected them to cover a track from AGENT STEEL, instead they gave us an oldie from ANTHRAX. Metal Thrashing Mad gig! Next in row was DARK FOREST, a traditional Heavy Metal band I face for the very first time on stage. Germany is the ideal country to witness bands like this, here they’re wanted and respected. DARK FOREST did what they were expected to do and helped the audience in warming up the hall. TYRANEX wasn’t a familiar band to me but on the bus some friends told me this is a very good new Thrash Metal band. On stage they played some old school Thrash Metal that took the spectators by the throat at once. A three man band? Not exactly because those high pitched screams are created by their front woman? Although this is a young band they stood tall on stage and they were able to please the crowd! 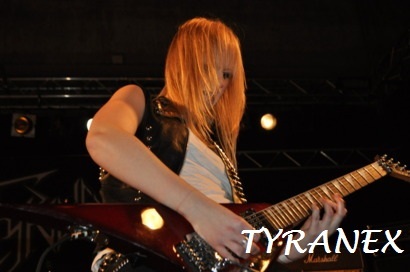 Sharp dressed riffs, aggressive vocals with often high screams, an energetic performance! The German crowd adores it, that’s for sure! This is Swedish dynamite and their album “Extermination Has Begun” must be worth checking it out. SINISTER REALM is an US Metal band that addicts of the genre must known. I was curious about the band, certainly after I heard their both efforts. Not exactly “in your face” Metal but SINISTER REALM showed why Oliver and co brought them to this German stage. A good performance with musician who really believe in what they’re doing. No disappointments, a good gig. I know people who travelled to Wurzbürg to see RAM. These Swedish lads just released a new album but I wasn’t fortuned to already discover it. Nevertheless the band needs no introduction to me because their brand is first class pure Heavy Metal. Long haired musicians, dressed in leather, playing one after another sharp played Metal track. The band seemed to be in a big shape and performed on a very energetic way! Pure class, pure Metal! RAM will probably never break really through and that’s a pity because this is the third time I witnessed how good this band really is. PAGAN ALTAR is an obscure Doom/NWOBHM band that is worshipped by many fans you meet on this kind of festivals. To be honest this kind of Metal isn’t exactly my English cup of tea but I forced myself to watch their gig. It’s because of the music, not because of the band’s performance I was bored by this gig. Fans called their show fantastic, I suppose it was for them. THE SANITY DAYS, does it ring a bell? 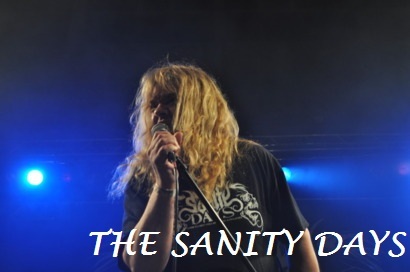 “In Search Of Sanity” does? Yes, the Onslaught album that really didn’t fit the row but is a masterpiece ‘an sich’. I have always been a big fan of this release and I remember seeing the band, on this tour, many years ago. Steven Grimmett impressed me that particular day and I have always been a fan of him ever since. Grim Reaper, his old NWOBHM band was another classic band and so I was expecting a lot from THE SANITY DAYS. They took off with the intro of the “In Search Of Sanity” day to follow with the title track; fantastic! Furthermore songs like “Shellshock” and the outstanding semi-ballad “Welcome To Dying” were performed. “See You In Hell”, the mighty classic song set the place on fire and THE SANITY DAYS ended their performance with their AC/DC cover “Let There Be Rock”. Grimmett is still a fantastic singer but he should consider the fact that a second guitar player could empower his new band! This was a great gig, a band that I hope to see in the future again! SATAN has released the best NWOBHM album ever! I’ve said it before and I will keep on repeating it! This particular album was more influencing than you think or what do you think those US Power Metal bands were looking at when they saw the first rays of light? I was fortuned to see the band several times before and they were one of the main reasons I travelled 600 kilometers. 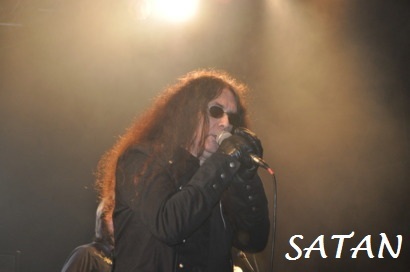 SATAN is a fantastic live band and they proved it once again. At the last edition of the Keep It True Festival they played the entire “Court In The Act” but they didn’t this time. Yet I was enjoying their classics from that almost 30 years old album and Steve Ramsey is still an outstanding guitar player. Brian Ross did what he is famous for; singing with a clear voice and screaming high, the kind of screams I am getting goose bumps from. This was a perfect performance and I was thrilled when the organizer of the Metal Of Ages Festival promised us that the band will be co-headliner at the next edition of this Belgian festival! We’ll be there again to bow our heads deep to these Metal Gods! Several years ago I saw HEIR APPARENT at one of the editions of the Keep It True Festival. I remember they were outstanding. Peter Orullian was their front man and he did a fantastic job. Later he joined FIFTH ANGEL and believe me if I say he will blow you away on their new album! Paul Davidson, the original singer, couldn’t make it to the METAL ASSAULT II festival so the band was obliged to search for a late stand in. It was their only choice or they were forced to cancel the tour. So, a man called Jeff Carrel was found and the poor man needed to learn 15 songs on 5 days. An impossible job… This man has a good voice but it didn’t fit at all with HEIR APPARENT. The man doesn’t have the charisma you would expect from a front man of these old aged Progressive Metal band. Although I adore this band, this gig didn’t do anything to me. I was bored although musical wise the band delivered us a perfect show! 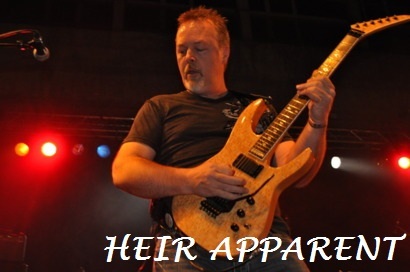 Jeff Carrel would fit in plenty of other bands… but not HEIR APPARENT! The magic of songs like “The Candle”, “Tear Down The Walls”, “Keeper Of The Reign”, “Dragons Lair” and “The Servant” vanished… A cover from BLACK SABBATH, “Heaven And Hell” was also foreseen but I can’t deny I was deeply disappointed. Of course I respect the fact the band appeared anyway, of course Jeff Carrel is a man with a good voice but this was only half of HEIR APPARENT, a band that demands a first class vocalist! I remember when I heard SANCTUARY for the very first time I was totally getting insane! This was the ultimate kind of Heavy Metal; power, melody, superb guitars, outstanding songs and Godlike vocals! The band only released two albums and I can’t say which one is better; both are written in gold in the history book of Heavy Metal! The band never played in Belgium and I remember their split-up really pissed me of so many years ago. NEVERMORE came a few years later and I became again a fan although I pity they hardly played SANCTUARY tracks on stage. 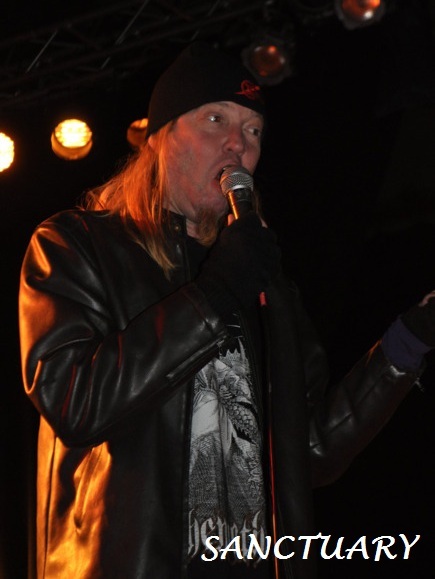 NEVERMORE is meanwhile also history and so Warrel Dane started up his first band again. But is he able to reach those high notes again? That’s the main question of all the fans and believe me there are lots of them! Warrel Dan’s hairs aren’t that long anymore but I was thrilled the band showed up to headline the METAL ASSAULT II festival. 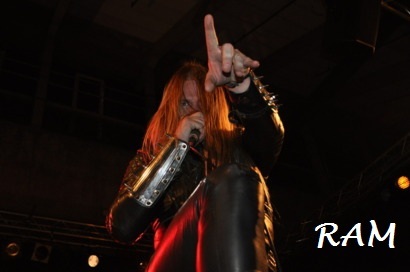 After a dark intro these US Power Metal gods gave us the best songs of both albums. “Battle Angels”, “Termination force”, “Future Tense”, “Long Since Dark”, “The Mirror Black”, Hell yeah! The last song was “Taste Revenge” and it set the place on fire! Was it a good show? Yes it was, although Warrel Dane isn’t able to bring the songs like they used to sound. Nevertheless he did the best that he can and it was no lie that the man was amused of his own Eighties Metal show! SANCTUARY deserved to be the headliner of this festival and a new album is coming, the only question is what label will offer them a contract. I don’t really care because I’m still a fan! After so many editions of the Keep It True festival I was pleased that I could make it to this METAL ASSAULT fest. Oliver did again a fantastic job and I really mean it when I say this man deserves a statue! The trip by bus was fun with ‘friends for life’! The trip back was hard and longer than expected and I must have had some kind of nightmare about seafood, mussels and some kind of pink holes… Strange but believe me it was fun! We’ll be back next year!